Azure Blobs is a great, inexpensive, and scalable cloud storage service that you can use to host any static file. 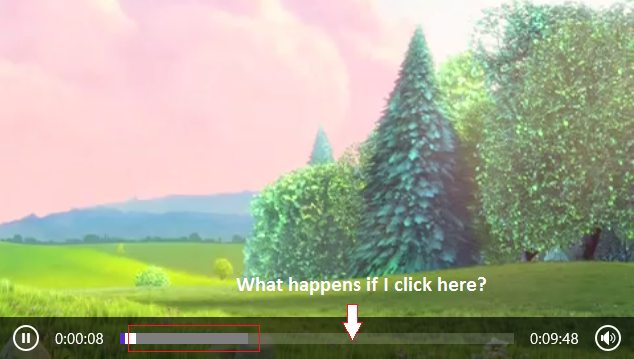 In particular, I find it extremely useful for hosting progressive download videos (e.g. .mp4 files). Note: if you need the uber-solution (encoding, adaptive streaming, …etc) check out Windows Azure Media Services which offers a full range of services to deliver high quality video to a range of different platforms. While Azure Blobs is very easy to setup and manage, there’s one essential configuration setting you will want to change before serving progressive download video that isn’t so obvious: byte-range support. Let’s start with the problem. 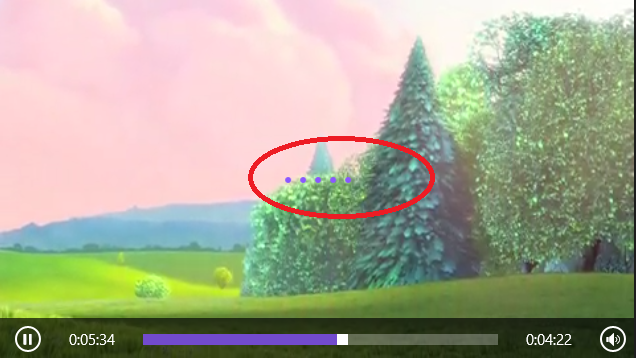 Out of the box, if you throw a .mp4 file on your Azure Blobs container and point your video player at the video, you’ll see the video play and buffer just fine. But, what happens, when you try to seek to an unbuffered portion of the content? Result: Buffering, waiting, annoyance, time for a coffee break? 2) the solution: tell the server to skip all the data yet to be buffered prior to the new position (identified below in red) and instead start buffering from the new position. The good news is, Azure Blobs does support this, you just need to enable it by setting the default version of the service to a newer one. The bad new is, this setting is not exposed in the Azure Portal nor most tools I’ve used (e.g. CloudBerry). So how do it change it? Send a Set Blob Service Properties REST API request. Seriously? Isn’t there an easier way? Well, there are free tools out there to do this for you. For example: Plasma AzureBlobUtility. 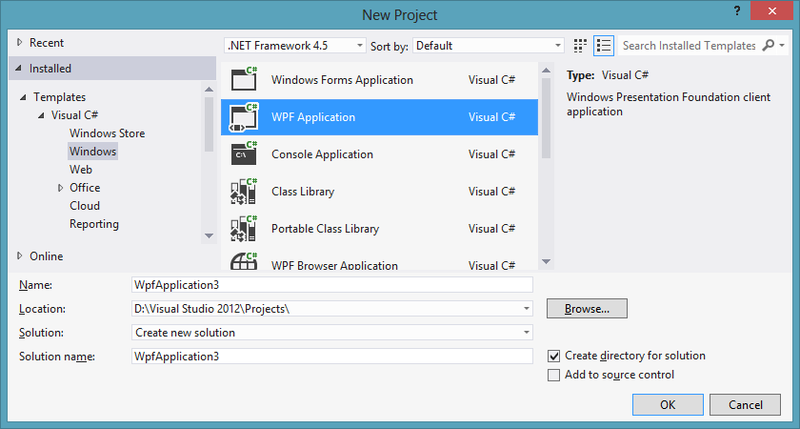 Create a new C# project. (I chose a WPF application which is probably not the best choice but I’m just going to throw this away when I‘m done). 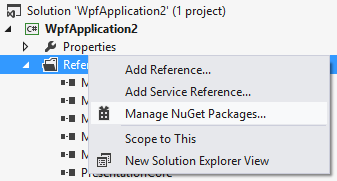 Add a NuGet package for Azure Storage by right clicking on your project and choosing Manage NuGet Packages. 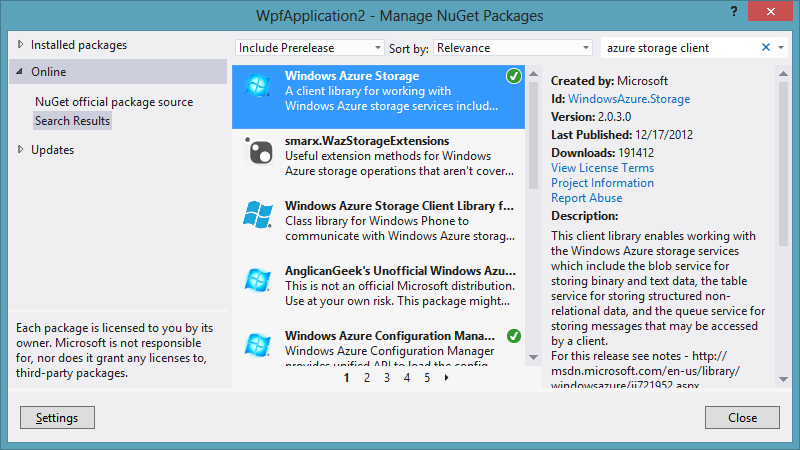 Search for “azure storage” and install the “Windows Azure Storage” NuGet Package by Microsoft. Notice that we didn’t need to specify the container. This change will apply to all containers for that account. DONE! Now all videos served from your Azure Blobs account will support seeking into the unbuffered area of the video without significant delay. This week Microsoft finally revealed its pricing structure for Windows Azure hosting services. Using Azure to host the simplest website in the world costs a minimum of $0.12 / hour. Work out the math: 0.12 * 24 * 30 = $86.40 / month. While this might sound reasonable to a large organization with tons of traffic or anyone currently using Amazon EC2 or Rackspace’s Mosso, this is way out of reach for the majority of developers and organizations who are just trying to create a useful webservice or website that could scale in the off chance their idea took off or got mentioned by the press. Based on this pricing it’s obvious that Microsoft is trying to compete with Amazon and targetting the same market. Nevertheless, I personally had high hopes that Microsoft was actually trying to compete with Google App Engine by offering the first and only affordable and scalable Windows hosting option… which raises the point: (in case anyone from Microsoft is listening) if Microsoft wants .NET to compete long-term as a server-side platform (which is essential for Windows to thrive as a server-side OS), someone is going to have to solve this problem soon or it will find itself playing catch-up. I love Windows Azure and I believe it is a great, simple and affordable option for the big boys. But as Windows Azure leaves beta and the world says hello, I say goodbye before I have to start coughing up ~$100/mo for my personal websites. Back to shared hosting at GoDaddy ($4/mo for Windows + SQL). I’ve tried to avoid commentary blogging but in this case can’t help but offer a few opinions and predictions on the 3 biggest scalable hosting options today for Windows servers. Over the last year I’ve spent a lot of time thinking about scalable hosting and working with both Mosso Cloud Sites and Amazon EC2. I’ve recently also been able to get down to business with Windows Azure hosting and have developed some opinions about how the three stack up against each other. This is by no means meant to be an exhaustive comparison of the three but merely my impressions from a 30,000 foot view on the choices for scalable Windows hosting today. Control: Amazon EC2 offers the most control. Aside from the internal guts of EC2 and the ability to deploy multiple instances, Amazon EC2 is for all practical purposes a dedicated server. You control every aspect of it and are responsible for it as you would be for any other dedicated server. The up side to this is that if you need to install 3rd party software on your hosting environment, impersonate users, or do any number of other rare and unusual things that you can’t do on anything but your own box, you have the all the control you could want with EC2. The downside of course is that you have a lot of rope to hang yourself with and Amazon isn’t going to come to your rescue when you do so. Ease: Mosso and Azure definitely share the prize here. Who wants to worry about installing security patches, deploying new server instances, user permissions…etc. As a developer before an IT administrator, I want to spend my time developing, not configuring and mainting servers. Let the Mosso staff (same company as Rackspace) or the folks at MS (the company that wrote Windows Server) do this work for you. Upload and scale w/o worrying about much more than your code. Price: Both Mosso and Amazon EC2 are around $100/mo. Windows Azure pricing has yet to be announced. The big question in my mind is whether Azure will be like Amazon S3 where if you have super low usage you get charged practially nothing? With S3, I once saw a bill for litterally 1 cent! Or, is the pricing going to be like Amazon EC2, where your cost to host a site that is practially never hit still costs a minimum of almost $100/month? Conclusion: Why use EC2 unless you need the extra control? – Which by the way, I did need the control and settled on EC2 for my latest project. But as time goes on and we rely less and less on legacy code, server component vendors start using best practices to write their components, and the standardization of web services, more control will be necessary less often. Amazon may eventually offer something that competes with Mosso and Azure in terms of ease of use, but for now the two stand alone in this niche rivaled only by shared hosting (which of course lacks the scalability). Azure has potential to dominate the market but this will all depend on pricing. Azure can go down the road of Mosso and EC2 and compete purely on features, or it can be priced in a way where you pay for only the horse power that you use and open the cloud computing flood gates and admit those with tight budgets. This won’t matter to many medium and large companies who need at least one dedicated server but it matter tremendously to everyone else who needs less than a server to host their applications and sites. If MS wants this audience (presumably the majority of those that need hosting), it must make it’s price scale like it’s hardware. Here’s a chance for MS and Azure to really change the world of software and cloud computing. By choosing a pricing model that scales at the low end, they could essentially eliminate cost as a constraint to launching an application in the the cloud. Never will a developer abandon an idea because it costs too much to make sure it could scale. If they go with the Mosso/EC2 pricing model where you get charged a relatively large amount for having a nearly idle server, then the majority of programmers will be left to suffer traditional, unscalable, shared hosting a little longer while those of us with the bigger budgets will have 3 great choices for scalable Windows hosting.